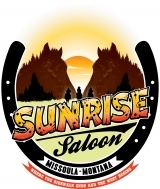 The Sunrise Saloon is Missoula's only dedicated Country-Western entertainment venue. Open from 8a.m. to 2a.m. every day. You're always sure to have a great time at the Sunrise!